Welcome to Gumnut Yarns. 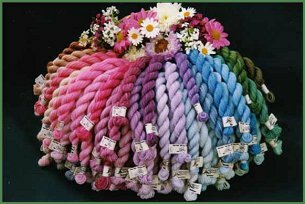 Since 1994 Gumnut Yarns has specialised in the production and wholesale supply of our hand dyed Embroidery Threads. Located in Bathurst, NSW Australia, we use the finest of natural fibres - silk, wool and mohair to create an ever expanding palette of unique threads. Our subtly shaded threads are suitable for all forms of hand embroidery - thread painting, cross stitch, stumpwork, hardanger, needlepoint and wool embroidery - to mention a few. Be inspired by the many Embroidery Designers, Published Projects and Needlework Designs that use our threads so skilfully, or try Gumnut Yarns hand dyed natural silk, wool and mohair threads using our Free Sample Card. Enquiries from retailers who wish to stock our threads are welcome. We regularly update our website, so please visit us again soon.